If you manage inventory at multiple locations, the Location Info tab can be particularly handy for getting a bird's eye for inventory status, lot and serial numbers, and all transactions that have come from a particular location. You can edit these notes by either clicking the Edit Notes... button, or by simply clicking inside the Notes area itself. If you click the plus sign, you'll be able to drill down on bin-related details, such as the bins) where the Item is located, the quantity, and whether that quantity is available or reserved for other transactions. Transaction List. This table is a comprehensive list of all transactions that have taken place at the current location. These could be Sales Order, Purchase Orders, Customer Returns, virtually any transaction type you can name. 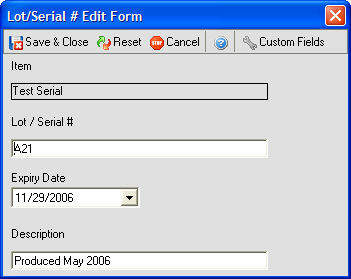 Double-clicking a particular record will open the transaction in question.